This site documents some of the archival resources of Alfred Health, which includes The Alfred, Caulfield Hospital and Sandringham Hospital. Alfred Health archives contains a collection of unique and culturally valuable items sourced from the hospitals within its network including records, memorabilia, medical instruments and photographs some dating back to 1868. Alfred Health is a leader in health care delivery, improvement, research and education striving to achieve the best possible health outcomes for its patients and community by integrating clinical practice with research and education. Alfred Health is the main provider of health services to people living in the inner southeast suburbs of Melbourne and a major provider of specialist statewide services to the people of Victoria. These services are provided across the continuum of care from ambulatory, to inpatient and home and community based services. Alfred Health has a strong commitment to research and undergraduate and postgraduate training for medical, nursing, allied health and other support staff through its major partnerships with Monash and LaTrobe Universities. It has important research and development links with the Baker IDI, the Burnet Institute and Monash University as a partner in the Alfred Medical Research & Education Precinct (AMREP). Alfred Health is recognised as a pacesetter in the national health care arena and has consistently been linked to progressive developments in health care and services, medical research and health care teaching. It has always been at the forefront of developments in clinical services to ensure patients have the best possible care. It has also been a leader in implementing new models of care to ensure greatest accessibility for patients and efficiency of service delivery. Alfred Health services are provided from the following 3 campuses:The Alfred, Caulfield Hospital and Sandringham Hospital. The Alfred hospital was founded in 1869 as a result of the work of a number of Melbourne doctors who fought a long and internecine battle for an additional general hospital treating its first patient in 1871. Prahran Council donated a parcel of low lying land for the provision of a Hospital. In 1870, the Melbourne architect, Charles Webb, won the competition to design The Alfred Hospital with his revolutionary design.Webb incorporated the "Nightingale" design principles by designing large light filled pavilions as wards connected by covered corridors or walkways. Since its inception, The Alfred was at the vanguard of health care provision. Not only was health care provision physically remote from the advances being made in Europe and the United States, the rivalry between The Alfred and the Melbourne Hospital inspired a culture of self sufficiency based innovation. During the early 20th Century, the Hospital was home to a number of temporary army tents to treat patients during the outbreak of the meningitis epidemic in 1915 and the Spanish influenza pandemic in 1918. In the Second World War and the Vietnam War, The Alfred hospital medicos staffed field hospitals in war zones. The Hospital has a long tradition of medical innovation including the first working heart-lung machine developed at The Alfred in 1957 and continues with this tradition with many new innovations regularly appearing in the electronic and print media. While the Hospital is the second oldest general acute care facility in Melbourne, it is the oldest facility to be operating on the same site. 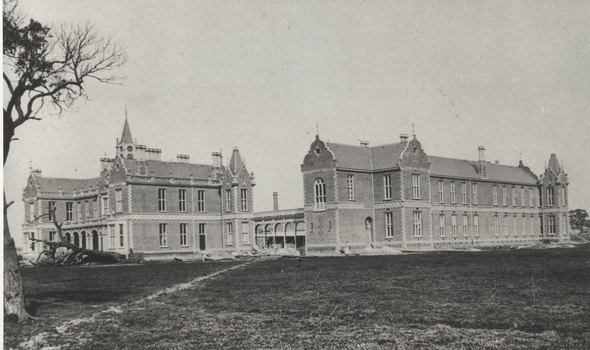 Charles Webb's original Queen Anne design was slowly replaced with more modern buildings with the Linay Pavilion as the last element of the original hospital enveloped within the modern hospital complex. The main activity of The Alfred's archives is indexing its material working towards the 150 years celebrations for the hospital in 2021. For almost 100 years, Caulfield Hospital and its predecessors on the site in Kooyong Road have been caring for people in the community by providing expert healthcare and treatment across a broad range of services. From 1916 when the hospital was first established as an Army Hospital, it provided vital healthcare services to returned servicemen and women from the First World War. Through the years, the hospital has continued to maintain this strong link with the veteran community. The [Royal] Southern Memorial Hospital,which amalgamated with Caulfield Hospital in the late 1980’s, was situated on part of the site for some 20 years. Today, Caulfield Hospital provides a range of speciality services to the Alfred Health community in the areas of Community Services, Rehabilitation, Aged Care, Residential Care and Aged Psychiatry. These services are provided in hospital, in the community and at home. The hospital has a statewide role in the provision of rehabilitation services. Caulfield Hospital offers a diverse array of treatment programs tailored to meet patients' specific needs, while promoting independent living through accessible and flexible services. Programs are delivered to patients in a range of settings to suit individual requirements. Caulfield Hospital is a formal training centre for Monash University medical students and has strong links with LaTrobe University and the University of Melbourne. The hospital also facilitates specialised postgraduate training in Aged Care, Rehabilitation and Aged Psychiatry. The Sandringham and District Memorial Hospital, now Sandringham Hospital, opened on15 March 1964. Over the years, this hospital has played a vital role in the community by providing exceptional and outstanding care that has earned it an enviable reputation as a community hospitalwith a strong focus on meeting the health care needs of its local community. The hospital plays an important part in the delivery of Women's & Children's Health for surrounding areas including a 20 bed Maternity and birthing centre, a level 2 Special Care Nursery, Breastfeeding Support &Paediatrics.Maternity, Breastfeeding Support and Gynaecology services at Sandringham Hospital are managed by the Women’s, which is part of the statewide tertiary specialist women’s hospital, the Royal Women’s Hospital. The hospital has an Emergency Department,General Medical Units and Nursing Care teams support elective surgery generated by Alfred Health, including Anaesthetics, General Surgery, Gynaecological and Orthopaedic, an Outpatient Clinicand anumber of ambulatory care services including a 12 chair Dialysis unit. These records are digitised by Alfred Health on Victorian Collections for the purposes of education and preservation. If you believe that we have infringed your copyright please contact us and we will remove the material from the site. eMelbourne - A brief history of the Alfred Hospital. Monday and Wednesday, 10.00am to 4.00pm. Ground Floor, Monash Building, The Alfred Tuesday 10.00am to 4.00pm Undercroft, Caulfield Hospital Visiting Hours - by appointment only. The Alfred Archives is the home of the Hospital's collection of unique and culturally valuable items. The Archives contain records, memorabilia and photographs dating back to the formation of "The New Hospital Committee" in 1868 which was the antecedent to The Alfred Hospital which opened on 6 March 1871. The collection represents an invaluable cultural asset to the State of Victoria and the Hospital as it portrays the evolution of hospital life and health care provision in Melbourne since the later half of the 19th Century. The Alfred Archives was established in 1995 as a centre for the protection of the Hospital's heritage collection and for historical research. The collection contains documents, photographs and medical instruments some dating back to 1871. The role of the Archives is to protect items of ongoing evidential and cultural value and to communicate the history of the Hospital through its heritage activities. 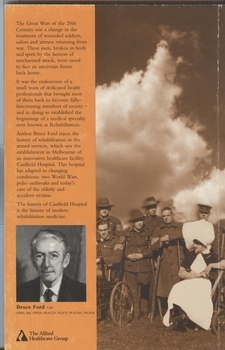 Key document recording history of hospitals located on Caulfield Hospital site since 1916. Earliest photograph of The Alfred immediately prior to its first treating patients on 6 March 1871. 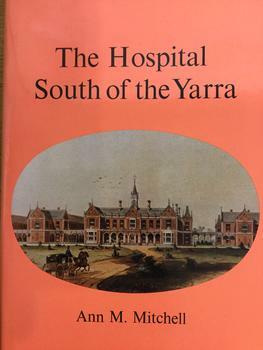 Board of Management of The Alfred commissioned Ann M Mitchell to write a history of the hospital from its foundation until the nineteen-forties. The hospital treated its first outpatient on 6 March 1871 and its first inpatient on 13 March 1871. Book details major milestones of hospital's history from 1860's including its naming after Prince Alfred. Records major achievements including important treatment, teaching and research. Lists many important personnel including doctors, nurses, matrons and Board Members.